(15/100) TRENTON – The Christie Administration has adopted new rules that will implement a compromise between recreational and commercial fishing interests over access to artificial reefs off the coast of New Jersey, Department of Environmental Protection (DEP) Commissioner Bob Martin announced today. The rules allow commercial interests to have continued access to portions of two reefs in state waters and calls for the construction of a new reef for recreational fishing, also in state waters. The DEP’s Division of Fish and Wildlife holds permits for 15 artificial reef sites – 13 in federal waters and two in state waters. The reefs, encompassing a total of 25 square miles of ocean floor, are constructed from a variety of materials, such as rocks, concrete and steel, even old ships and barges. These materials provide surfaces for a wide diversity of marine organisms to grow, providing food and habitat for many species of fish and shellfish. Under the rule adoption published this week in the New Jersey Register, commercial fishermen will be permitted to continue using portions of two existing reefs in state waters off Sandy Hook and Manasquan. State waters extend to three miles offshore. Recreational fishermen will continue to have access to all portions of these reefs. Commercial and recreational fishermen will be required to use lobster, fish and conch pots on the Sandy Hook and Axel Carlson Reefs in specific “full access zones.” Commercial and recreational anglers and sport/scuba divers will continue to have full access to all parts of the reefs, including the full access zones. In addition, commercial and recreational lobster potters setting and tending gear within the full access zones must do so only between the hours of sunrise and sunset and they must call the Marine Law Enforcement Headquarters two hours prior to doing so. Individual pots in these zones must be marked with a buoy. A string of pots must have a buoy attached to each end. A new reef, encompassing about a square mile of ocean floor, will be constructed in state waters in an area north of Barnegat Inlet for use by recreational anglers. The Division of Fish and Wildlife is working with a DEP Division of Land Use Regulation and U.S. Army Corps of Engineers in securing permit for this project. This new reef will encompass roughly the same area as the portions of existing state waters reefs commercial fishermen may use. The DEP, in consultation with stakeholders and the Army Corps of Engineers, will finalize a site for the new reef. This plan is expected to resolve federal concerns that commercial fishing is intruding on and hampering recreational fishing on artificial reefs in state waters, which are funded by excise taxes on recreational fishing gear and motor boat fuel. 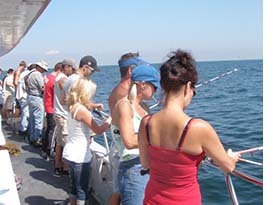 “On behalf of saltwater anglers I’d like to thank Commissioner Martin, the Christie Administration, and the bipartisan support shown by legislators to resolve the gear conflicts occurring on reefs,” said Anthony Mauro, Chairman of the New Jersey Outdoor Alliance. The DEP is working with the federal Mid-Atlantic Fishery Management Council for Special Management Zone designation which will allow the DEP to prohibit commercial gear on all 13 existing artificial reefs in federal waters. Federal waters begin three miles offshore.